A user with Subscription sales access can create subscriber portals. The portals are RunMags hosted, secure and responsive web pages where subscribers can sign up for and pay for their subscriptions using their credit card. Upon a successful transaction, the data is automatically pushed to RunMags for continued management of the subscription and subscriber records. RunMags uses Stripe.com as payment gateway and this is how you connect your Stripe account to RunMags. 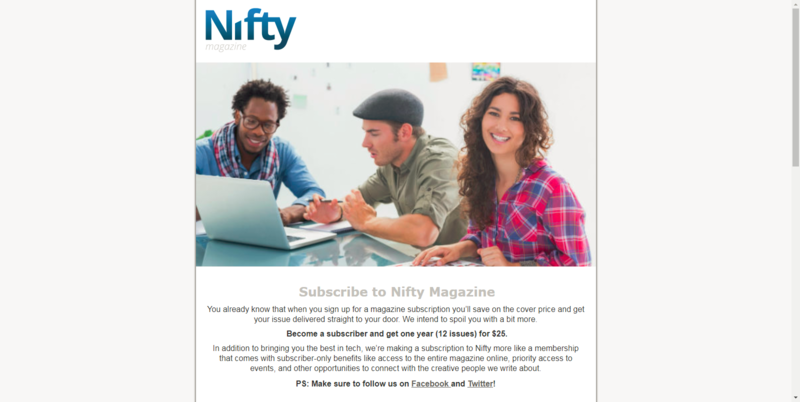 To set up a subscriber portal, go to Subscription sales and then Portals. Click the upper new button to create a new overall campaign collection of new portal pages or the lower one if you want to create another portal page within the currently selected campaign collection. Each overall campaign collection have three tabs with related information. First portal pages, then the connected subscription products and finally any sales order resulting from the campaign. As you can set up campaign collections with different subscription products from your Channels, you can create various offerings, for example seasonal campaigns or renewal campaigns with reduced pricing compared to your normal list price. 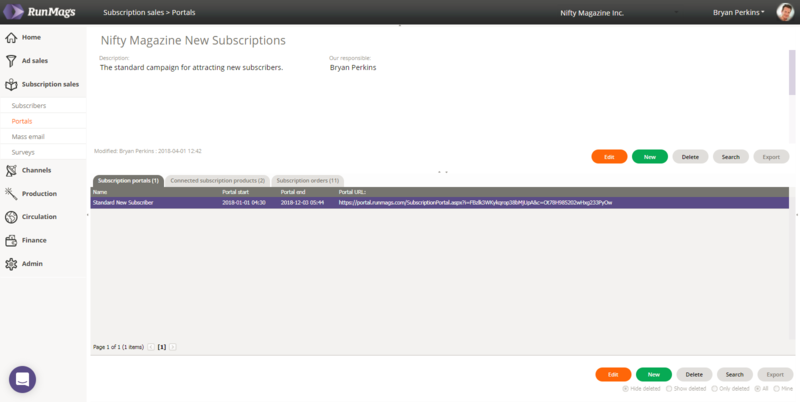 To create a new subscription portal page, click the lower new button. In the form that opens up, customize the portal page with your logo, images and value proposition. The various forms fields are somewhat self-explanatory in nature, but contact our support if you need help. Before you can sell subscriptions with the page, you need to connect subscription products to it. To do this, go to the second tab named Connected subscription products to set up which subscription products you want to make available in the portal. 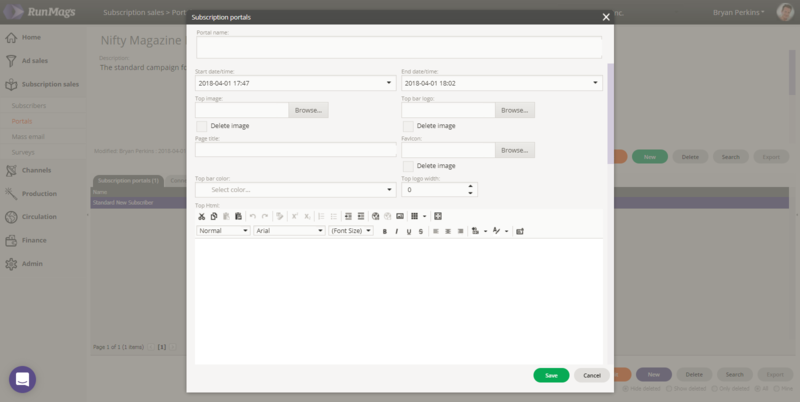 You can select one or several subscription products from your print channels to be available in the portal. In addition to using our portal framework as described above, you can also use our API to have your own portal push subscribers into RunMags where you can manage them. The RunMags API can be accessed here.